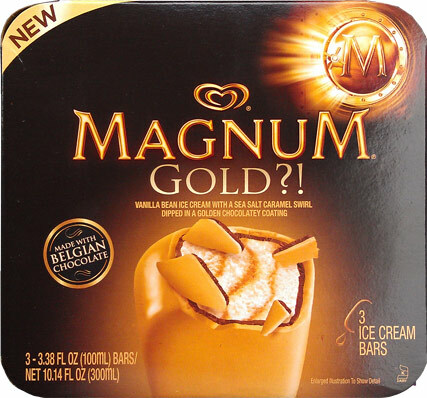 Well I just had an awesome lunchtime dessert because I've found the brandy new (to the U.S.) Magnum Gold Ice Cream Bars and all I can really say is "Oh my bloody word are these things good". I was psyched to see this box staring at me, and on sale for $3.49 no less (at Stop & Shop). Magnum Gold?! 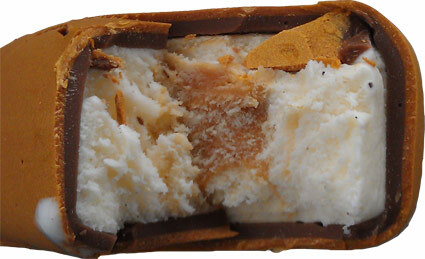 is Vanilla Bean ice cream with a sea salt caramel swirl dipped in a golden chocolate coating. Is the gold a flavor? a gimmick? I don't really care because it looks super fancy and I need to open the box now. I take my first bite and I am literally blown away by just how thick and wonderful this shell is. I don't even know how to describe it other than it tastes like it's fresh from some fine chocolatier shop. I almost thought I was biting into some smooth white chocolate for a moment. Epic, that's all I can say really, Epic. I mean look how thick it is? The double chocolate shells are a neat trick, but when they become one it's like wrapping ice cream in a candy bar (or a chocolate Easter bunny). I don't even remember the last time I was left speechless, the chocolate flavor is just that surprising and wonderful. Now the shell cracked on this bar, so I did have a little trouble eating it. I should have went for the slow and steady approach, but instead I just started crunching away. For the most part, the shell stuck to the bar when I would bite a chunk off, so that was helpful. The ice cream inside is full of caramel and vanilla bean flecks. Again I was kind of overwhelmed by flavor on this first scooping so all I can say is that it's soft and wonderful and I'll try harder next time. It's just so tasty, but there has to be a catch right? Well, I looked down and sure enough I am now gold like my ice cream bar. Too funny.... I wipe off my finger and then my mouth - yup, that's gold too. I should have seen that one coming! Even know as I sit here with my happy (and full) belly, I still can't really describe what I just had. It's just this wonderful smooth chocolate taste and I swear there is almost this subtle hint of coffee to. Stay tuned for the second scoop later today. On Second Scoop: Look, I never claim to be anything more than just a guy with a spoon, and this treat proves it. I still have no other comments other than the fact that the shell is super crunchy. I have no idea how to describe the taste here. All I know is that I start eating it and I don't want to stop. Danielle, you have no idea how jealous I was when Dubba told me he found these. Nick, we need to go storm the MA stores! I found them and they are epic! Epic is awesome...I can not wait until I have my hands on a whole box ~ yummy!